The Missing Class gives voice to the 54 million Americans, including 21 percent of the nation's children, who are sandwiched between poor and middle class. While government programs help the needy and politicians woo the more fortunate, the "Missing Class" is largely invisible and ignored. 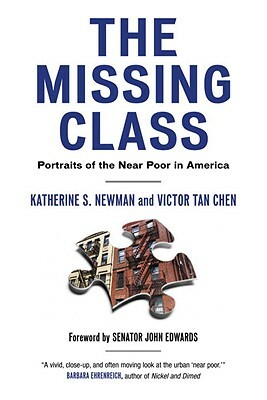 Through the experiences of nine families, Katherine Newman and Victor Tan Chen trace the unique problems faced by individuals in this large and growing demographic-the "near poor." The question for the Missing Class is not whether they're doing better than the truly poor-they are. The question is whether these individuals, on the razor's edge of subsistence, are safely ensconced in the Missing Class or in danger of losing it all. The Missing Class has much to tell us about whether the American dream still exists for those who are sacrificing daily to achieve it. Katherine Newman is professor of sociology and James Knapp Dean of the Krieger School of Arts and Sciences at Johns Hopkins University. Author of ten books on middle-class economic instability, urban poverty, and the sociology of inequality, Newman has taught at the University of California-Berkeley, Columbia, Harvard, and Princeton. Victor Tan Chen is the founding editor and president of INTHEFRAY Magazine (http://inthefray.org/), an award-winning publication that seeks to question, inform, and inspire conversations about identity and community. His work has appeared in numerous publications, including Newsday and the Minority Law Journal, and in the book Chutes and Ladders. He is a Harvard doctoral candidate in sociology and social policy.